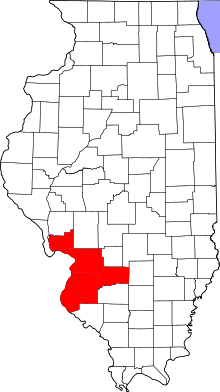 Metro East is a region in Illinois that comprises the eastern suburbs of St. Louis, Missouri, United States. 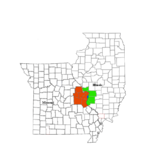 It encompasses five Southern Illinois counties (and parts of three others) in the St. Louis Metropolitan Statistical Area. [ citation needed] The region's most populated city is Belleville, with 45,000 residents. The Metro East is the second largest urban area in Illinois after the Chicago metropolitan area and, as of the 2000 census, the population of the Metro East statistical area is 599,845 residents, a figure that has risen above 700,000 in 2010. [ citation needed] The significant growth in the Metro East is mainly due to people in smaller outlying towns in Illinois moving to the area for better economic/job opportunities. The Metro East is a loose collection of small and mid-sized cities sitting along the American Bottom and the bluffs of the Mississippi River. According to the U.S. Census Bureau, the five counties of the region have a total area of 6,974 km2 (2,692 mi2). 6,787 km2 (2,620 mi2) of it is land and 186 km2 (71 mi2) of it (2.74%) is water. As of the census  of 2000, there were 599,845 people, 229,888 households, and 160,260 families residing in the five Metro East counties. The most common language is English, although various other languages are spoken. German speakers exist in southeastern Madison, and Clinton, and southern and eastern St. Clair Counties. Spanish is spoken in the Fairmont City area, and in parts of Clinton County. The largest concentration of African-Americans is in Madison, Venice, western Granite City, East St. Louis, Washington Park, Belleville, Cahokia, Alorton and Alton. Secondary languages tend to be cultural or reminiscent of ancestry, and not related to the general business of the area. The Metro East is connected with Missouri by the Metro Link light rail train. 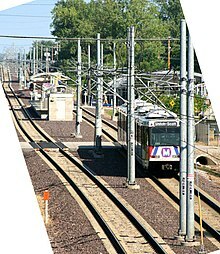 The Metrolink includes 11 stations on the Illinois side of St Louis, from the East St. Louis Riverfront, through Belleville Illinois, and ending at Scott Air Force Base. It links the Metro East to downtown St. Louis, area universities, downtown Clayton, and the major commercial airport, Lambert St. Louis International. Note: This list is for the entire Metro East area; however, the low-powered stations may not reach the entire five-county Metro East area. WSIU, despite not being based from the St. Louis DMA, is available in Clinton, Washington, and most of St. Clair. Note: This list is for Jersey County; however, the majority of these stations are not available for most Jersey County residents. These stations are more likely to be available in Greene and Macoupin counties, which border Jersey County. Note: This list is for St. Clair, and Clinton counties; however, the majority of the stations, with the exception of WSIU and WPXS and possibly KFVS, are not available for a majority of the St. Clair, and/or Clinton County residents. These stations are more likely to be available in Washington County and the Centralia area. Note: daily newspaper coverage depends on county. Note: stations listed are licensed and have offices in Metro East counties only. Stations that can be heard in the Metro East but not listed have offices outside the Metro East counties. Note, the following is a partial list of films shot, often partially, sometimes with significant production, within the Metro East. All data can be rechecked via the Internet Movie Database. "Uncredited" means a Metro East location was not credited within the database, but was clearly shot on Metro East soil upon watching the film itself. 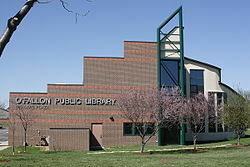 Laurell K. Hamilton has used the Metro East as a setting in several books from the Anita Blake and Merry Gentry series. In the Merry Gentry series, fairies of the Unseelie Court have made their home in Monk's Mound. Area code 618: the majority of the Metro East is in this area code. ^ Staff (2012). "Main". U.S. Census Bureau | American FactFinder. American FactFinder. Retrieved 27 May 2012. ^ DOUG MOORE; JEREMY KOHLER; NICHOLAS J.C. PISTOR (20 February 2011). "Metro East growing more diverse, census data show". STL Today. Retrieved 27 May 2012. ^ "10 Best Towns for Families: 2010", Family Circle, Retrieved on 2010-08-07.